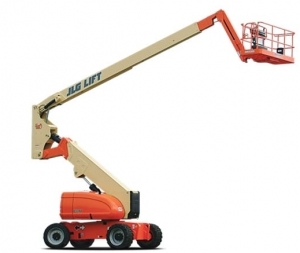 Articulating Boom Lifts are ideal for reaching elevated locations for window cleaning that are not easily reached by a telescopic boom lift, The tower of the boom elevates to clear most obstructions that are up to 32ft in height which in turn allows the straight telescopic boom to reach the location for cleaning. The boom can be rotated around 360 degrees and can be operated by our operatives to form the work platform to full working height so as not to waste time in moving the boom when cleaning the windows of your building. Scissor Lifts are used where greater lifting capacities and larger working areas are required. They may be manoeuvred when elevated and single or dual extending decks increase the working area further. 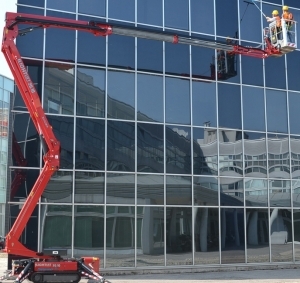 They can lift to a height from 7.79m to 18.15m and have a width of between 0.76m and 2.29m so as the reach tricky positions when cleaning They can be operated from the work platform so can save time in moving when cleaning the windows. 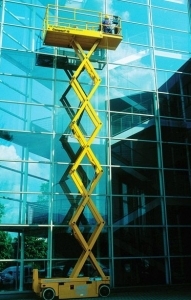 Millards Window Cleaning Services Ltd supply a wide range of commercial scissor lifts. 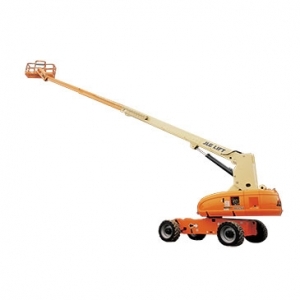 A scissor lift is a work platform that is used to carry different loads or people.